Shabbat Shirah shows us that the most celebratory moment in our history was captured in song, and sealed with the music and dancing of women, led by a Prophetess. 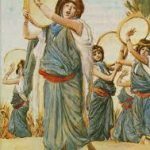 "And Miriam the Prophetess, Aharon's sister, took the drum in her hand; and all the women went forth after her, with drumming and dancing"
Torah is filled with mechanisms for bringing us closer to God through sacred words and music. Shabbat Shirah, which is on January 27th this year, is a special Shabbat for focusing on the power of music in celebration and with re-creating sacred moments. We can tell from this special text arrangement that this is a song rather than prose. The Song of the Sea can be read, chanted or sung. For verses 1-3, there is a tune that is not the regular Torah trope; it is a bittersweet musical mode, designed to reflect the gravity of receiving redemption from Egypt at a high cost to the Egyptians. This bittersweet melody brings up a personal memory for me; that of a moment in the Jewish weekday service. It is a moment of reliving the revelry and the sadness of the scene at the Sea of Reeds. The sacred sound that comes to me is of the voices of the staff and students of the Jewish Theological Seminary (JTS) Cantorial School in New York, where I studied Sacred Music. 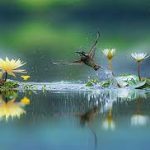 Is there a melody, or song, or nign (chant sans words) that transports you, too, into a sacred space? Therein is the power of music and song; it creates sacred time and space, whether in a house of worship or while out running errands. Sometimes in my work as a Spiritual Care Chaplain, I might hum this melody or maybe another nign, to transport myself into a prayerful or grounding mode between seeing patients, on my way to meetings, or during my breaks. These chants are a simple, portable, and direct conduit from everyday busy-ness to a different dimension--of sacred place. Now as we come to the end of the Torah’s passage of the Song of the Sea, the Torah gives us another treat. We read how it was the women who sang the closing lines of the Song. Led by Miriam the Prophetess, the Israelite women all take up drums and dance, singing the closing words of the song. Torah tells us Miriam was a Prophetess, in fact that is her name, מרים הנביאה Miriam haNevi'ah in 15:20, Miriam the Prophetess; then after that she is called אחות אהרון Aharon’s sister. Her relationship to Moses is not mentioned here. 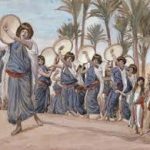 Torah describes how Miriam picked up a drum, and the next thing, all the women do the same; and following after her, drumming and dancing, they sing the words that close the Song of the Reed Sea in 15:21. The next musical memory of the Song of the Sea: from my year at JTS, at Commencement. 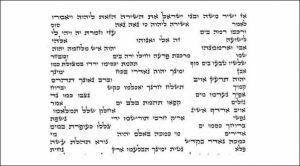 Truth be told, I was not in the Cantorial School to become a pulpit Cantor, but to learn the traditional music of the Jews so that I could adapt it to musical instruments. Nonetheless, they made me learn to sing! and there I was, with lots of coaching and mentoring, an Alto in the JTS choir, singing my heart out alongside some of the world’s finest Cantors. At Commencement, the newly ordained and invested rabbis and cantors queued up on the marble stairs inside the great JTS inner atrium for a group photo. Someone started a nign from the Song of the Sea, 'Ozi v’zimrat Ya', from 15:2. My summer with JTS included a Chaplaincy Internship with the VA Hospital in Brooklyn. Having a Middle-Aged--Jewish--Woman, as a VA Chaplain was a stretch for some of my male peers and teaching supervisor! But when the VA Staff Chaplains heard I was a Musician, they snapped me up, to facilitate a weekly ‘Music and Spirituality’ group for the VA’s new Substance Abuse Rehab program. The participants in this program were amazing. All of them, except one Jewish man, were Black or Hispanic; the Jewish Veteran sadly had lost his connection to Judaism over the years. Most of the dozen men were Veterans from Vietnam, fifty year ago. Somehow they survived long enough to make their way to this VA Hospital and this rehab program. They had been coping and using drugs for 50 years. The piercing, plaintive sounds told them I knew the territory. After breaking the ice, they talked—a lot. Each week I tried something different: they never knew what the little Chaplain Lady was going to do next! It became time for me to put off my fear of singing for them. Mulling over what I could pull off, I realized that the best thing was to lead what I know; always a good thing for an artist. I chose two nigunim and one of them was 'Ozi', the same tune as with the Women of the Wall. I chose these Hebrew nigunim rather than a familiar song in English. I did not want the words to interfere, I wanted them to sing with their own heartsong-voices. First a baritone sang along, then a couple more hesitant voices. 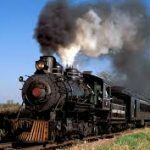 The baritone got stronger and shortly we were all singing, as if a mighty locomotive had slowly chugged out of the station and was now steamrolling full throttle down the tracks. Soon, they were on their feet, and then I knew it was time for me to step back and get out of the way. The song from the Torah now took on the timbre of a Sunday morning Harlem Gospel Church chorus. They bent, and shimmied, clapped in time, singing, fully liberated-- rocking the room as it filled with warmth and love. The love train barreled down the tracks. I now engaged the most important lesson in Davvening (Prayer) leadership training: how to bring a train like this safely back in to the station! I resumed singing with them, bringing in hand gestures to match theirs, then slowed them down, then sat them down, then wound down the volume and tempo until the train puffed to a rest. The room was silent. They knew from experience what to do next. The camaraderie from the singing had created a new sacred space to share with each other, and heal. I can’t say that I am a singer or a successful pulpit Cantor, but I can say that I know how to adapt the power of music and the stories it carries as a medium, for creating healing opportunities. Those of us who are musicians, including Miriam haNevi'ah, understand that what we do is intangible; and thus will seldom be given the honors it deserves. In today’s Song of the Sea, Music and Women are given the Crowns and Honors. Shabbat Shirah shows us that the most celebratory moment in our history was captured in song, and sealed with the music and dancing of women, led by a Prophetess.